If I could write a book about this past offseason, it would be called “The Waiting Game”. The 2017-18 NHL offseason was supposed to be one of the most active in recent years, with the decision of the Islanders’ John Tavares hitting the open market and then-Ottawa Senator Erik Karlsson on the trade block. There were tons of trade speculation that especially picked up around the time of the 2018 NHL Draft. … And then almost all of it died down. The trade rumor mill was on and off multiple times, especially with Karlsson. As trade chatter seemingly started to pick up mid-July, it quieted down just as quickly, with just the Jeff Skinner trade to Buffalo. Fast forward two months later. The 2018-19 NHL season is upon us. Players and teams are starting to gear up for training camp. Suddenly, everything is in motion again. Max Pacioretty is acquired by the Vegas Golden Knights, and finally the Erik Karlsson trade everyone had been waiting for (unless you’re a Ottawa Senators fan). I’ll get to that more later in this preview. So how did the San Jose Sharks fair in the offseason? Well, they were one of the many teams who were reportedly in on the Tavares sweepstakes. They’d cleared as much cap as they could, sending Mikkel Boedker contract and trading Barracuda defenseman Julius Bergman to the Ottawa Senators in a three-way deal that ended up sending troubled winger Mike Hoffman to the Florida Panthers. They bought out Paul Martin’s contract, let Eric Fehr, Joel Ward, and Jannik Hansen walk via free agency (and let’s face it, three out of four of those players were headed out anyway). Unfortunately, despite their best efforts, they couldn’t land the biggest fish. Sure, people can be mad at Tavares for holding out for as long as he did to make his decision, and they likely still are. Islanders fans definitely feel betrayed by the former captain. But the fact of the matter is how we feel is moot at this point. Toronto managed to snag John Tavares out of the free agency waters and there’s nothing we can really do about it. However, they did manage to get one huge, huge consolation prize. Hell, you could even argue that I shouldn’t even call it a consolation prize because it was a blockbuster trade. That’s right, ladies and gentleman. Your general manager, Doug Wilson, managed to acquire former Ottawa Captain Erik Karlsson in what might be the biggest blockbuster trade in franchise history since the Joe Thornton trade a long while back. Hell, it might even be bigger than that trade! That’s how huge this is. When I’d initially started writing this preview, the Sharks had lost out on Tavares and there was some uncertainty as how the Sharks were going to proceed into the season, other than to go in with largely the same lineup. Evander Kane re-signed to a seven-year, $49M deal ($7M AAV) with a modified NTC that kicks in starting this upcoming season. Joe Thornton re-signed to a one-year, $5M deal with an NMC. Tomas Hertl re-signed for four years, $22.5M ($5.625M AAV). Let’s talk about Jumbo Joe. I can understand if there are people in this fanbase who feel that Doug Wilson should have just let Thornton walk. As a matter of fact, I wouldn’t have been mad either way. The guy’s a generational player. For Doug Wilson to pull the blockbuster deal off and bring in a player of his caliber onto the team, us fans can’t thank him enough for that trade and Joe Thornton for what he’s done for this franchise. That said, he’s not getting any younger. Thornton is 39, almost 40 years old. He turns 40 during next summer’s free agent frenzy. I honestly would not be surprised if this is his last season in teal. I’d think either he retires after this season or he signs with another team. Having said that, there’s genuine concern about whether the Sharks front office did enough to prepare for a post-Thornton era. That’s why it will be really interesting not only seeing whether if the Sharks will capitalize on what could be his swan song season in teal, but whether or not Doug Wilson still has a couple of moves up his sleeve. With the top six still in tact, we look at the bottom two lines where there has been some significant movement because of the trade as well as free agency. With Ward, Hansen, Fehr, and Tierney gone from the team, there are going to be holes to fill, and barring more trades they are going to be filled by some of the young prospects like Rourke Chartier and Antti Suomela. Then you’ve also got Barclay Goodrow and Melker Karlsson battling for a fourth line spot as well. On the blue line is where the magic happens. With the departure of Paul Martin from the blue line, you currently have Joakim Ryan paired up with Brent Burns. With Erik Karlsson on the roster now, you have his versatility. So you can slot him in any one of those three defensive pairings. You can have Karlsson paired with Marc-Edouard Vlasic, which would be the best defensive pairing in hockey. You can bolster your offensive potential from the defense by putting him together with Burns. Of course, we’ll more than likely see that happen on the power play. And then you’ve got a Brenden Dillon-Erik Karlsson pairing. Joe Thornton recently recovered from a second knee surgery, and given his age and where he’s at in his career, there’s legitimate concern over how well he could fare this upcoming season. However, judging from training camp alone, it seems that the 39-year-old future Hall of Famer is already back to full speed. Thornton sat out the remainder of the 2017-18 season as well as the entirely of the postseason after colliding with former teammate Mikkel Boedker. That’s in contrast to the 2017 postseason, when he basically played on one knee against the Edmonton Oilers. With Opening Night four days away, the Sharks need him to stay healthy throughout the year if they’re going to have a legitimate chance at the Cup. Evander Kane will be another player to watch for this year. Acquired at last year’s trade deadline for former Sharks prospect Danny O’ Regan, Kane finally has a chance in a full season to prove his morals on a winning team in the San Jose Sharks after spending parts of his career in Buffalo and Winnipeg. The Sharks will need him to not only produce goals on the ice, but also stay out of trouble off the ice. It’ll be up to Kane to keep his nose clean. The 27-year-old left winger scored a career-high 30 goals with the Winnipeg Jets in the 2011-12 season, and came close to reaching the 30-goal plateau again in the 2016-18 seasons. As I mentioned earlier, the San Jose Sharks made an all-out splash to acquire Erik Karlsson from the struggling Ottawa Senators. Unfortunately for Ottawa fans, the Sens will be struggling for an awful long time, but that’s a story and analysis for another day. As the saying goes, one person’s trash is another person’s treasure. Well, in this case Erik Karlsson isn’t necessarily trash. As a matter of fact, he’s far from it, and his play on the ice tells the whole story. Let’s talk briefly about what happened on the ice last year. The whole team around him wasn’t doing well. He was battling an ankle injury. His numbers were somewhat down. He finished the 2017-18 campaign with 9 goals and 62 points, and was a -25. So, even in a down year, he still managed to produce. In the year before that, Karlsson tallied a total of 71 points (17 goals, 54 assists) and was a +10. He had 18 points in the 2017 postseason run that nearly catapulted the Senators to their first Stanley Cup Final appearance in 2007, only to fall to the Pittsburgh Penguins. Doug Wilson had said that the Sharks needed a “difference maker” on the team. 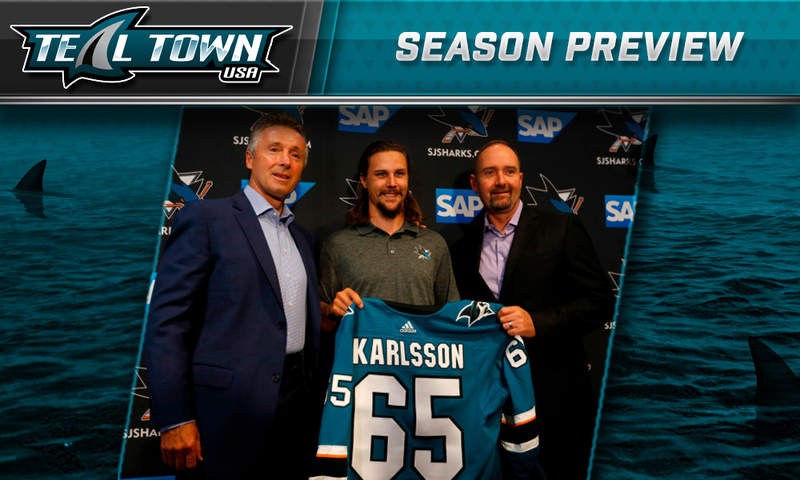 Erik Karlsson is as good as it gets, and from the reception that the trade got with billboards around the Bay Area as well as a full-page ad in the San Jose Mercury news welcoming 28-year-old defenseman, the general vibe in Teal Town is that this fan base has never been more excited as far as I can tell from my 18 years of being a fan of this team. With the acquisition, the Sharks now boast a blue line that’s among the top of the League, right up there with the Nashville Predators. When you look at the Sharks power play units, oh my goodness. You’ve basically got two Norris Trophy winners in Erik Karlsson and Brent Burns on the blue line, two guys with offensive prowess. With Erik Karlsson’s playmaking ability as well as Burns’ ability to shoot the puck, not to mention Brent Burns being a former forward, the rest of the league will have to take notice. We say this every year. The San Jose Sharks have been perennial playoff contenders since the 2003-04 season, only missing the playoffs in the 2014-15 season. They’ve only missed the playoffs six times in team history. They’ve been close numerous times, with three Western Conference Final appearances, as well as their one and only trip to the Stanley Cup Final in that 2016 Cup Run. With the Erik Karlsson acquisition being perhaps the biggest one to date, it’s now or never for the Sharks. Doug Wilson is going all in. It’s really up to the players to get it done at this point, barring some seriously bad luck with injuries. Whether or not that center depth holds up or Doug Wilson goes out and acquires another center is going to be something to watch at this point. This is the most excited I’ve personally been as a Sharks fan. Like I said there’s just a really good vibe within the Sharks Faithful that’s just been really hard to shake off since the trade, and while we really do wish Chris Tierney, Dylan DeMelo, Rudolf Balcers, and Joshua Norris luck in Ottawa, obviously we’ll see how things go when the puck drops on the new season on October 3rd. We’re ready to drop the puck, especially with San Jose also hosting the All-Star Weekend in January. So, strap those seatbelts on, Sharks fans. This is going to be one exciting ride, one that we hope finishes with a parade in June.